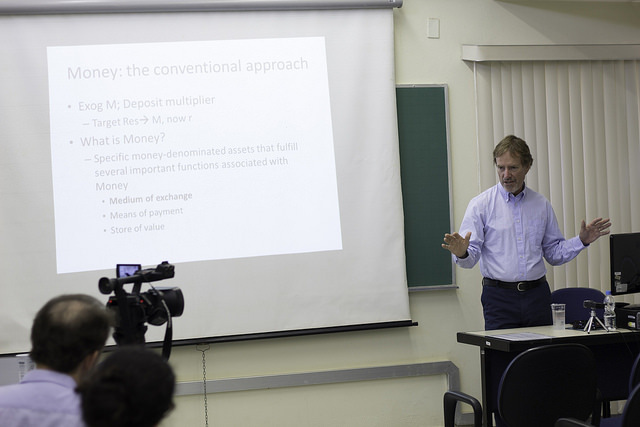 Wray also delivered a series of lectures in Trento for a course on Modern Money Theory and participated on a panel on the Job Guarantee: La rivoluzione dei Piani di Lavoro Garantito. Video of the latter presentations can be viewed here and here. Like the first conference, this year will feature contributions from fields as diverse as macroeconomics, law, history, public policy, and corporate finance, with the goal of creating a community of scholars working within the MMT paradigm. This year’s theme, “Public Money, Public Purpose, Public Power,” signals the MMT community’s efforts to build bridges between social justice movements, inspire broad-based participation, and more deeply discuss how our ideas may be concretized politically. The conference runs from Friday, September 28 through Sunday, September 30. Friday will feature roundtable discussions and keynote addresses from MMT luminaries on the origins of MMT, the process of making MMT “mainstream,” and the relationship between MMT and progressive advocacy for the job guarantee. Saturday will feature workshops facilitated by a range of community leaders and experts seeking to develop and deepen connections between MMT and other fields. Sunday begins with two “town hall” meetings, exploring MMT’s capacity as both a domestic and an international movement. The proceedings will conclude with a plenary session on the strategic and institutional goals of the movement going forward. To learn more about the Second International MMT Conference or to register, visit their website at mmtconference.org or email conference@mmtconference.org. Video from all the panels at the Minsky Conference can be found here. This is the second in a series of blog posts on financing infrastructure assets. From 1990 to 2012, the stock of global financial assets increased from $56 trillion to $225 trillion. 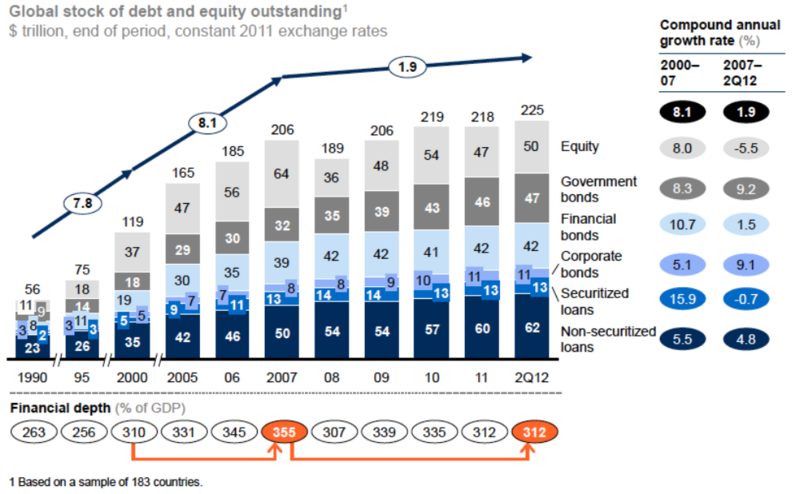 In 2012, it included a $50 trillion stock market, $47 trillion public debt securities market, $42 trillion in financial institution bonds outstanding, $11 trillion in non-financial corporate bonds, and $62 trillion in non-securitized loans and $13 trillion in securitized loans outstanding (Figure 1). The Job Guarantee is finally getting the public debate it deserves and criticism is expected. Building on several decades of research, the Levy Institute’s latest proposal analyzes the program’s economic impact and advances a blueprint for its implementation. Critics have taken note and are (thus far) restating the usual concerns, but with a notably alarmist tone. The latest, courtesy of the Washington Post’s Robert Samuelson, warns that the Job Guarantee would be 1) an expensive big-government takeover, 2) unproductive and impossible to manage, 3) dangerously disruptive to the private sector, and 4) inflationary. Samuelson wants us to be afraid—very afraid—of big government. But he forgets that we already have big government—one that devotes hundreds of billions of dollars, time, resources, and administrative effort to deal with all the economic and social costs of unemployment, underemployment, and poverty. Unemployment is already paid for. In this context, the program does not increase the government’s costs—it reduces them—while also cutting costs to households and firms and creating real actual benefits by supporting families, communities, and the economy. As David Dayen points out, whether we can afford the Job Guarantee is not up for debate. Will the Job Guarantee create impossible-to-manage make-work projects? This is a fear that James Galbraith—a self-proclaimed former skeptic of the Job Guarantee—calls “an admission of impotence and a call for preemptive surrender.” Kate Aronoff recalls that New Deal projects were often derided as boondoggles. Still, they rebuilt communities, the economy, and people’s lives, while leaving a lasting legacy. The Job Guarantee is subjected to a unique double standard for managerial efficiency. We never hear objections to going to war, “nation building,” or bailing out the financial sector on the grounds that these efforts would be an “administrative nightmare.” And yet our proposal to put our underutilized labor force to productive use, by using much of the existing institutional infrastructure in the nonprofit and state and local government sectors is dismissed as an impossibly difficult task. Pavlina Tcherneva — who, along with L. Randall Wray, Flavia Dantas, Scott Fullwiler, and Stephanie Kelton, authored this report estimating the economic impact of a job guarantee proposal (the Public Service Employment program) — was interviewed by Bloomberg’s Joe Weisenthal and Julia Chatterley about the purposes and costs of the plan. This recently released policy note by L. Randall Wray also takes on some of the criticisms raised by the interviewers, in addition to seeking a consensus among the job guarantee proposals emanating from progressive think-tanks. Insufficient or inadequate infrastructure in both developing and developed economies has sparked a debate about whether financing is sufficient to sustain infrastructure investment to at least keep pace with projected global GDP growth. The task of keeping the minimum investment required to maintain current levels and fostering incremental spending to close the infrastructure gap has revived the debate over the role played by each actor in closing the gap and how to finance this process (see for instance G-20 2013; OECD 2013; World Bank 2015). One of the major post-crisis challenges is that in spite of an ultra-low interest rate environment or even negative nominal and real rates, investment has been anemic in developed and developing economies (IMF 2015). This is particularly important because, since the crisis, investment has collapsed across all sectors (public, business, and household sectors) in Europe (McKinsey 2016, 2). And in the United States, “the trajectory of net fixed capital formation, which decreased from 12 percent of GDP in 1950 to 8 percent in 2007, then fell to only 4 percent in 2014. Average depreciation rates accelerated by about 20 percent during the 1980s as companies invested in shorter-lived assets such as ICT equipment but did not compensate in terms of higher gross investment rates. 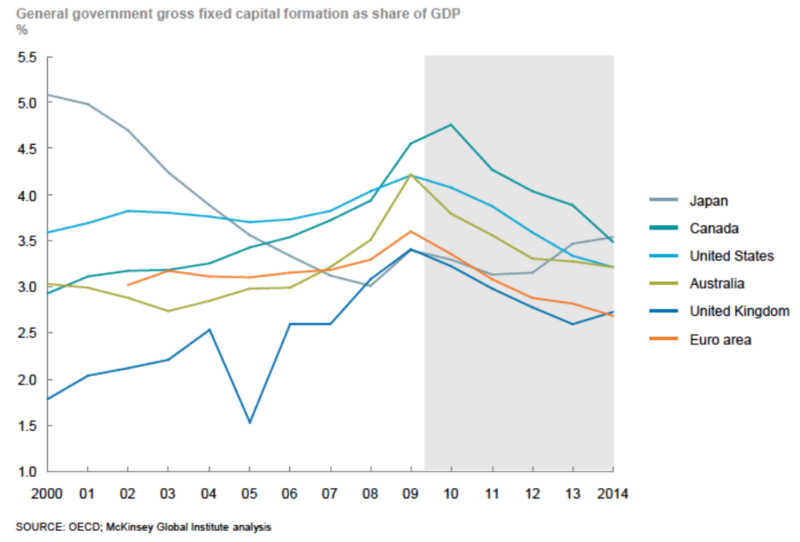 This amplified the decline in net investment” (2). To make matters worse, most governments in developed and developing nations (with the exception of a few cases) are cutting back on infrastructure spending due to fiscal consolidation (Figure 1), generating a public-funding shortfall in infrastructure investment. Video of all the sessions, speakers, and Q&A will eventually be posted on the Institute YouTube page. 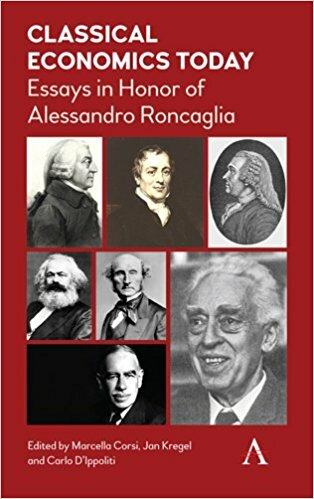 Classical Economics Today: Essays in Honor of Alessandro Roncaglia is a collection of essays that pays tribute to Alessandro Roncaglia whose research is based on Schumpeter’s dictum that good economics must encompass history, economic theory and statistics, and therefore does not generally take the form of elegant formal models that are applicable to all and everything. In this direction, Roncaglia is inspired by the Classical economists of the past and becomes a model for present-day Classical economists. A perceptible family air imbues the essays: all the contributors are friends of Roncaglia and see his personality and his interests as a common point of reference. The Levy Economics Institute of Bard College is pleased to announce the ninth Minsky Summer Seminar will be held from June 17–23, 2018. The Seminar will provide a rigorous discussion of both the theoretical and applied aspects of Minsky’s economics, with an examination of meaningful prescriptive policies relevant to the current economic and financial outlook. It will also provide an introduction to Wynne Godley’s stock-flow consistent modeling methods via hands-on workshops. The Summer Seminar will be of particular interest to graduate students, recent graduates, and those at the beginning of their academic or professional careers. The teaching staff will include well-known economists working in the theory and policy tradition of Hyman Minsky and Wynne Godley. Applications may be made to Kathleen Mullaly at the Levy Institute (mullaly@levy.org), and should include a letter of application and current curriculum vitae. Admission to the Summer Seminar will include provision of room and board on the Bard College Campus. The registration fee for the Seminar will be $325. Due to limited space availability, the Seminar will be limited to 30 participants; applications will be reviewed on a rolling basis starting in January 2018.